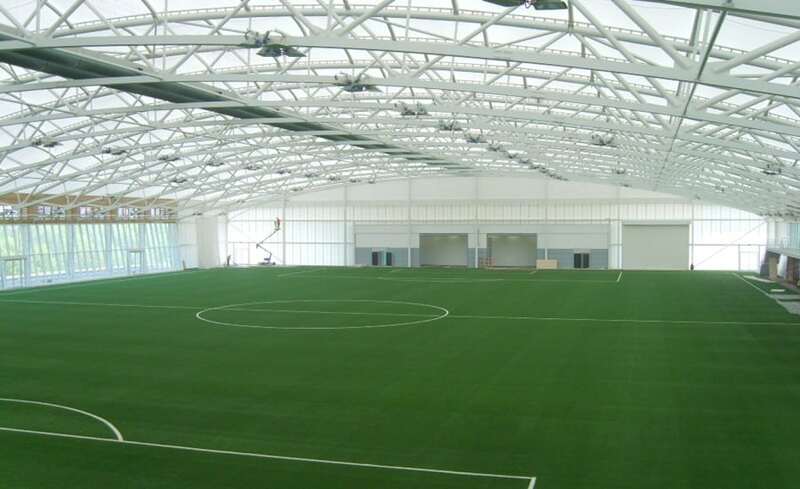 St. George’s Park, the new 105m home to the new National Football Centre, is the official training base for 24 England Football Teams. 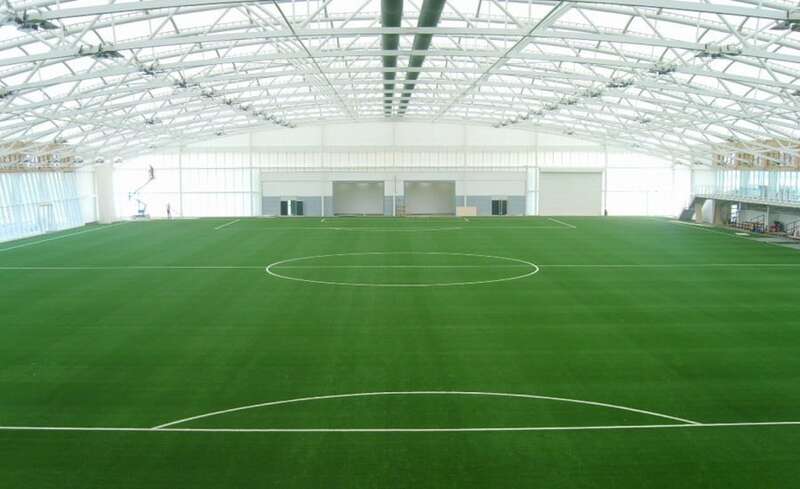 The highlight of the facility is the light and airy PVC coated polyester fabric covered full size football pitch. 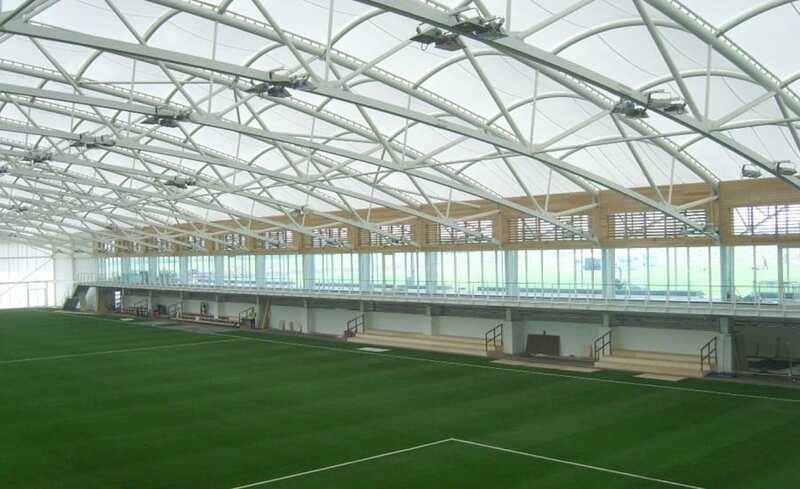 Working with Red Box Design Group, Architen Landrell designed, manufactured and installed 13,500m2 of Ferrari PVC coated polyester fabric over the artificial football pitch and 200 person viewing gallery. 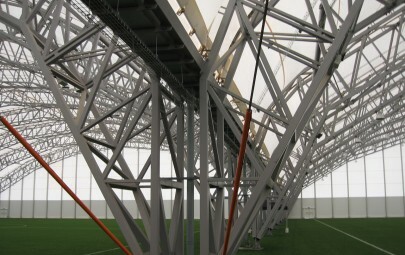 Fabric was chosen for the roof of the new pitch because it cost effectively spans large spaces. 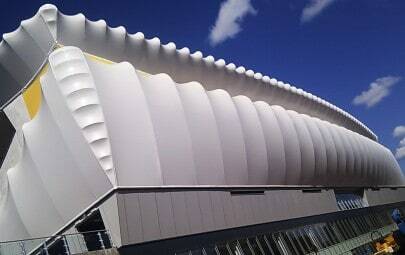 The building housing the football pitch measures 120m x 80m and a fabric roof made sense on many levels. 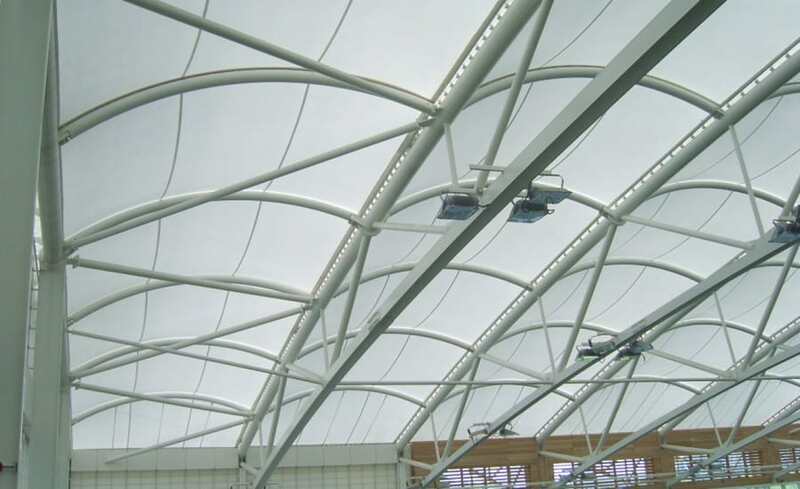 PVC is lighter than glass which allowed the Centre to save money on the need for additional steel supporting framework. It also offers enough light transmission for football practice under natural sunlight and in all weather conditions. Working on a project of this scale required complete coordination. Four Mobile Elevated Working Platforms (MEWPs) operated in tandem moving along the muddy terrain allowing the installation teams to install the fabric at various heights and in multiple locations simultaneously. Poor weather conditions made the installation challenging. Rain turned the ground into mud, bogging down the plant. Wind was also a deterrent. Installing fabric panels of this size in the wind is dangerous and as a result the project was occasionally delayed by acts of nature. Patterning and production of 13,500m2 of fabric was no easy task. Besides being an industry leader, Architen Landrell was chosen for the project because it has on-site manufacturing in its Chepstow Headquarters that could accommodate a project of this scale. 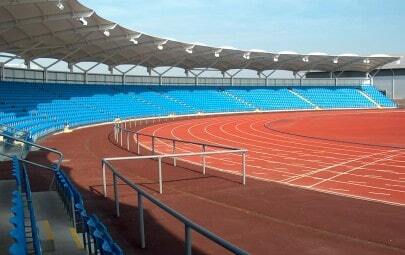 The result is a training facility that is world class and a benchmark for others to follow.